More than twenty years ago, David Hoexter (my husband) and I found, in an antiques shop in Maine, small ceramic containers printed with advertising . We didn't know what they were intended for, but they were attractive and made of earthenware, so we bought them. So began a journey of discovery and delight. 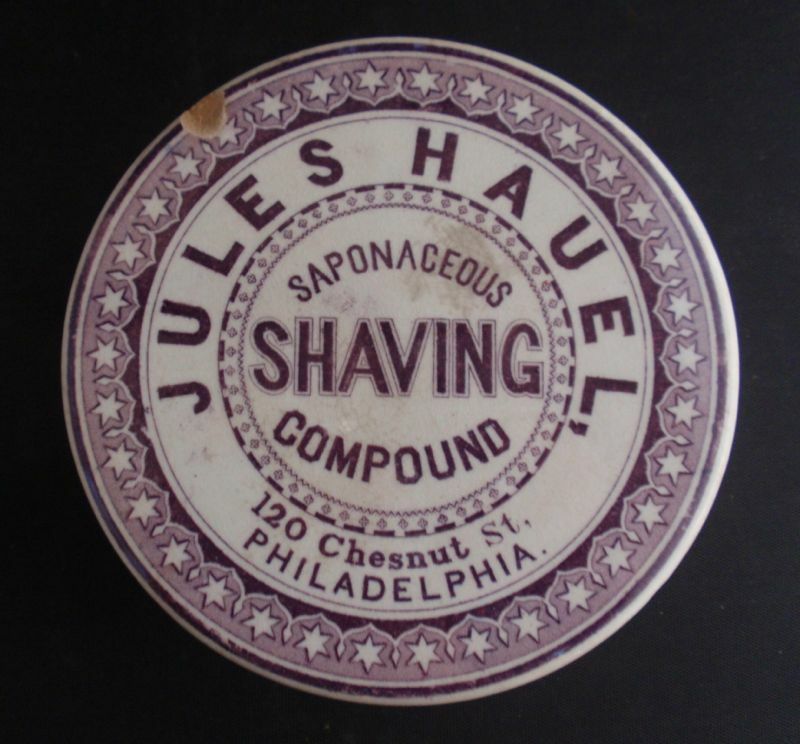 The more we researched, the more we became enthralled by the way medicine, food, hair products and more were packaged from the mid 19th century until about 1920. This is not going to be a post about pot lids (the generic name of this item), but I am going to stick to my blog mission statement (at least on occasion) which is "what I have learned from transferware." In this case, I have learned a bit about advertising and a new word. As you know, advertising is intended to entice you. The design of the pot lid here is attractive enough to encourage you to buy the product. However, the word "saponaceous" might make a buyer feel that he is getting a better shaving cream than one that is merely "soapy." I had to look "saponaceous" up in the dictionary. What a fancy adjective. 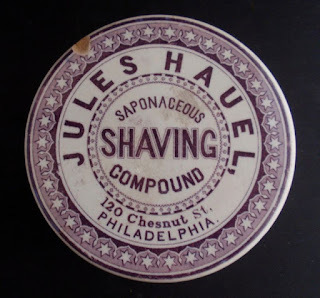 One thing that Jules Hauel or the English potter who engraved the copper plate for the pot lid didn't get right was the spelling of the street on which the company was located. I grew up in Philadelphia, and the spelling of the street is "Chestnut" with a "t."
If you want to learn more about pot lids see the article written by David Hoexter and Bruce Ring in the Transferware Collectors Club Bulletin, which is available along with many others as a PDF on the TCC website; http://www.transcollectorsclub.org/bulletin_previews/articles/PotLidsTCC2002Winter.pdf I have been having difficulty with this link (it keeps disappearing), so if you are interested you can find the article by going to Publications on the blue bar on the left of the homepage of the Transferware Collectors Club, http://www.transcollectorsclub.org Then follow TCC Bulletins and Sample a Selection of Articles. The Pot Lid article is the last one on the list.